The two day Rocky Mountaineer train journey between Vancouver and the Canadian Rockies is the shortest Rocky Mountaineer train trip available. This is a perfect journey for travelers with limited time. Any one of these options is also an excellent choice for travelers who want to plan their own Canadian Rockies itinerary that includes a Rocky Mountaineer train trip. These two day / one night trips are available, in both directions, from the last 10 days in April until the first two weeks of October. Choose from one of the options below. There is NO train service to Calgary. 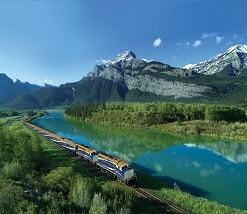 Shuttles, tours and rental cars are available between the Rockies and Calgary. Call us at 1-800-913-9207 or 604-990-9299, Email for more information and reservations. Call 1-800-913-9207or 604-990-9299 or Email for more information and prices.